White pudding or oatmeal pudding is a meat dish popular in Scotland, Ireland, Northumberland, Nova Scotia, and Newfoundland. It is also quite popular in Devon and Cornwall, where it is known as Hog's pudding. 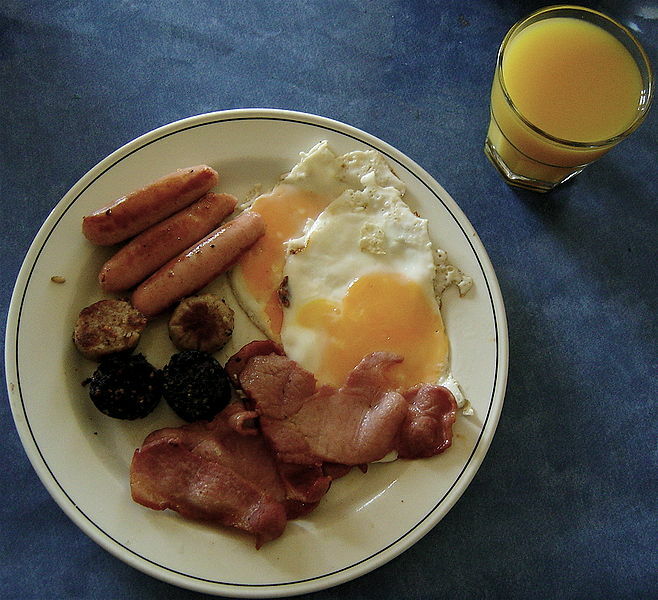 Left: An Irish breakfast consisting of sausages, black and white pudding, bacon, fried eggs and juice. It is very similar to black pudding, but does not include blood. Consequently, it consists of pork meat and fat, suet, bread, and oatmeal formed into the shape of a large sausage. Earlier versions (pre-1990) often had brain matter (sheep) added as a binding agent. In Scotland, white pudding can also be known as Mealy pudding and does not always take the form of a sausage. It consists of suet, oatmeal, onions and spices. Some versions of Scottish white pudding are suitable for vegans, in that they contain no animal fat, vegetable fat being used instead. The pudding may be cooked whole, or cut into slices and fried. It is an important feature of the traditional Irish breakfast (a regional variant of a full breakfast). White pudding (as well as its black and red relatives) is also served battered at chip shops in Scotland as an alternative to fish. When served accompanied by chips it is known as a White Pudding Supper.